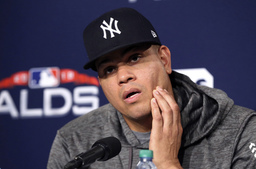 TAMPA, Fla. (AP) Yankees reliever Dellin Betances has inflammation in his right shoulder and will start the regular season on the injured list. New York general manager Brian Cashman said Betances has an MRI on Tuesday after the 6-8, 265-pound right-hander lacked velocity in his fastball. "He's had a history in the past of slow starting, but this was a little bit more longer and more significant than we recalled," Cashman said. Betances, who normally reached the upper 90s, has topped at 92 or 93 mph throughout spring training. He curtailed his offseason throwing program awaiting the birth of his child and was given permission to report a few days late for spring training. "I feel like I was trying to rush it," Betances said. "I just felt like I was behind the whole time. I'm not too concerned because I think it was just more for caution." Betances said he will not throw for three to five days. "We need to give him a timeout, hit him with an anti-inflammatory so we can restart that clock," Cashman said. Betances went 4-6 with a 2.70 ERA in 66 games last season. "Not the end of the world to have him miss a little bit of time and save some innings over the course of a long season," Yankees manager Aaron Boone said. "We're obviously going to need him and count on him in a big way." New York has a deep bullpen with Aroldis Chapman, Zack Britton, Adam Ottavino and Chad Green. Left-hander Stephen Tarpley is among the candidates to take Betances' roster spot. At least seven Yankees will be on the injured list when New York opens the regular season against the Baltimore Orioles on March 28: Betances, starting pitchers Luis Severino, CC Sabathia and Jordan Montgomery, outfielders Jacoby Ellsbury and Aaron Hicks, and shortstop Didi Gregorius. Exploring options to help fill the void with Severino and Sabathia sidelined, Green served an opener and allowed a run in the first inning before rotation candidate Luis Cessa went four scoreless innings in a 6-2 victory over the Tampa Bay Rays. Tampa Bay extensively used relievers as part of opener and bullpen games last season because of rotation injuries en route to a 90-72 record. "It's just another thing you can throw at a different team," Green said. "I wouldn't say every team is capable of doing it, but it seems like our bullpen is deep enough where we're able to cover some innings. For us, I think it makes sense. It's worked in the past for some teams. Obviously it worked for Tampa last year." Severino, out with right shoulder inflammation, will not be available until May at the earliest. Sabathia is likely to miss the first week or two as he recovers from an offseason that included knee surgery and the insertion of a stent after a blockage was found in an artery from his heart. Severino is set to resume playing catch Wednesday, while Sabathia is scheduled for his first minor league game Thursday. The Yankees agreed Monday to a minor league contract with 33-year-old left-hander Gio Gonzalez, who arrived in camp Tuesday and passed his physical. He could pitch in a game as soon as Saturday. Masahiro Tanaka heads a rotation that includes James Paxton and J.A. Happ. Cessa, Jonathan Loaisiga and Domingo German are competing for two open rotation spots. Abbey Burns, older sister of Yankees OF Billy Burns, threw the ceremonial first pitch. She has also done it at one of his games at Mercer College and Tuesday marked the seventh time with different pro teams Billy has been with. Abbey has competed in the Special Olympics in both equestrian and swimming. Tampa Bay two-way minor leaguer Brendan McKay is scheduled to be the starting pitcher in Thursday's game against Atlanta. "That will be exciting for all of us to get to watch," Rays manager Kevin Cash said. ... Opening day starter Blake Snell will make his final spring training start Friday in a minor league game. ... 3B Matt Duffy (hamstring) could play Thursday.